The lid of the ITER Bioshield is on! Sometimes a week can end with an adrenaline rush. This was the case on the ITER construction site, when on Friday 9 March, a spectacular lifting operation unfolded at the Tokamak Complex, the emblematic building which will house the world’s biggest fusion device. 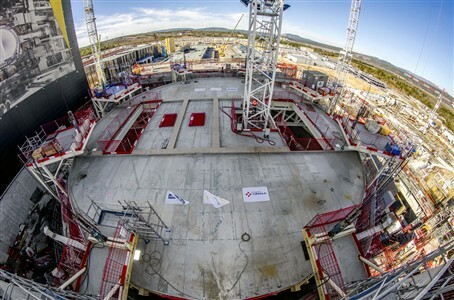 Early in the morning the teams of F4E and their contractors, together with ITER International Organization, took positions to lift the 30 m diameter lid of the bioshield. The VFR consortium (consisting of Vinci, Ferrovial, Razel), responsible for the civil works of this building, put its trust on VSL Heavy Lifting, a company specialised in heavy-load lifting operations, to perform this task. All in all took three hours to complete this operation and every minute counted for the 10 people participating in it. This is one of the key construction milestones set by the ITER Council and everybody is extremely focused. The day before, they run a drill lifting the lid only 10 cm so that they make sure all tooling is working well for this day. The technical teams placed eight hydraulic jacks on eight metallic structures, resembling to small platforms hanging 30 m high, in order to lift with cables the 150 t lid that will cover the cylindrical “tower” of the Tokamak building. Then, it will be fixed on beams and will remain on top until April 2020 when the first assembly operations begin. In August 2017, the 30 m metallic diameter cover made its first appearance on the ITER construction site. It was fabricated and positioned in the bioshield 15 m above the ground to allow the teams of workers to carry on with building more floors above and in parallel go ahead with the construction of the Tokamak concrete supporting structure below. Basically, 18 massive blocks of steel are being embedded in heavily reinforced concrete to form a “crown” that will support the ITER machine weighing 23 000 t. The volume of the concrete required is about 400m3 and each of the 18 supporting steel blocks is weighing more than 3 t. “A specific formula has been developed to produce this highly-reinforced structural concrete able to withstand a compression three times higher the concrete of a normal housing building” highlights R. Darbour, F4E’s Deputy Project Manager for Buildings, Infrastructure and Power Supplies.